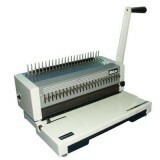 Produce quality cut Business Cards with this Electric Business Card Slitter from 12-UP 3.5"X 2" cards on a letter sized sheet. Demo model, like new! Manually punches up to 12 sheets for .248 pitch 3:1 plastic coil elements. Electric push button punch operation.